Your "Go-To" place for lifelong learning and enjoyment. The Library strives to inform, enrich and equip residents in our community by creating and promoting access to a wealth of ideas and information; by providing lifelong programs and activities and encouraging a love of reading. 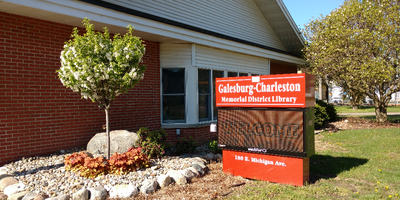 On August 7th, 2018, residents of Charleston Township and the City of Galesburg approved the renewal of a 1-mill property tax, with an additional 0.3 mill, for a period of 10 years (2019 - 2028) for the purpose of operating the district library. The current millage expires in December 2018. The additional funds will allow us to expand services and opportunities for residents. Thank you to everyone who supported our request! Library cards will be issued to any resident of the City of Galesburg, Charleston Township (except Village of Augusta taxpayers), and Pavilion Township (except those living within Portage Public Schools district). Proof of identify and residence are required. Minor children (17 years of age and younger) may obtain a library card with parent/guardian signature, and proof of identity and residence. For more information, visit the Library Procedures section on the About Us page. The Library offers a collection of more than 25,000 items for all ages, in a variety of formats - print & digital books, audiobooks, magazines, DVD & Blu-Ray movies.